I always recommend that designers and students make a typographic checklist to help avoid committing type crimes, as well as to aid in finessing their typography. At long last, I finally created a checklist that covers issues I’m most frequently asked about in my workshops. You can download the PDF and print it out. You can also click on the links to learn more, as I’ve previously published columns dedicated to most of these topics. You may find it useful to customize your own checklist from the topics below for a specific client or project. …and make sure that you are doing all of that on content that it is worth you time. 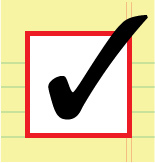 …”I finally create a checklist…” Should that be created? Great list, btw. Thanks for spotting the typo, Ang, so noted and corrected. No matter how many times I proofread, some things just slip thru the cracks! It seems that every time I submit my resume for review by a recruiter, they reference common mistakes that can easily be corrected. Unfortunately I am never given any hints. Thanks for the list. I now have a starting point.